New York City  The guest curator of The Ukrainian Museum's exhibition Alexander Archipenko: Vision and Continuity is Professor Jaroslaw Leshko. Dr. Leshko is Professor Emeritus of Art at Smith College in Northampton, Massachusetts, where he has taught the history of 19th and 20th century art for thirty-five years. He has also been a guest professor at Hunter College in New York City, at Amherst College, and at Mount Holyoke College. He received his B.A., M.A., M.Phil., and Ph.D. from Columbia University. Professor Leshko's interest in sculpture dates to his time in graduate school, where he studied the history and theory of sculpture with Rudolf Wittkower and H.W. Janson. At Smith College he taught courses on the history of sculpture and gave seminars on 19th and 20th century sculpture. Professor Leshko's area of interest is early modernism. He has lectured widely and curated many exhibitions, published numerous articles both in the U.S. and internationally, and authored four books: Orbis Pictus: The Prints of Oskar Kokoschka, 1906-1976; Jacques Hnizdovsky, 1915-1985: Retrospective Exhibition (exhibition catalogue); The Paintings of Arcadia Olenska-Petryshyn; and Smith College Museum of Art European and American Paintings and Sculpture, 1760-1960 (with John Davis). Professor Leshko is also the author of the comprehensive analytical essay in the illustrated, bilingual (English-Ukrainian) catalogue that accompanies The Ukrainian Museum's Archipenko exhibition. Alexander Archipenko: Vision and Continuity opens at The Ukrainian Museum on April 3, 2005, and continues until September 4, 2005. 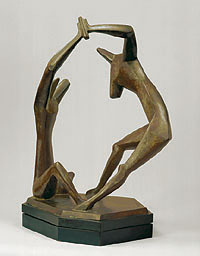 It includes some 65 sculptures and sculpto-paintings, the majority from the Archipenko Collection of the artist's wife, Frances Archipenko Gray, and the Archipenko Foundation, supplemented by a selection of works from private and museum collections.